So, I’m not entirely sure I can even call this a recipe. In fact, it’s a little embarrassing to call it one. But…..the kids loved this and were so super excited about it, that I thought I might as well share. Basically I popped some popcorn and tossed some things on top of it. Brilliant, I know. Well, at least in my kids eyes! And sometimes, that’s all that matters. They were super happy about this snack. And I let them eat it in their fort while we read stories so that just made it extra special, as I’m usually a stickler for eating at the table. 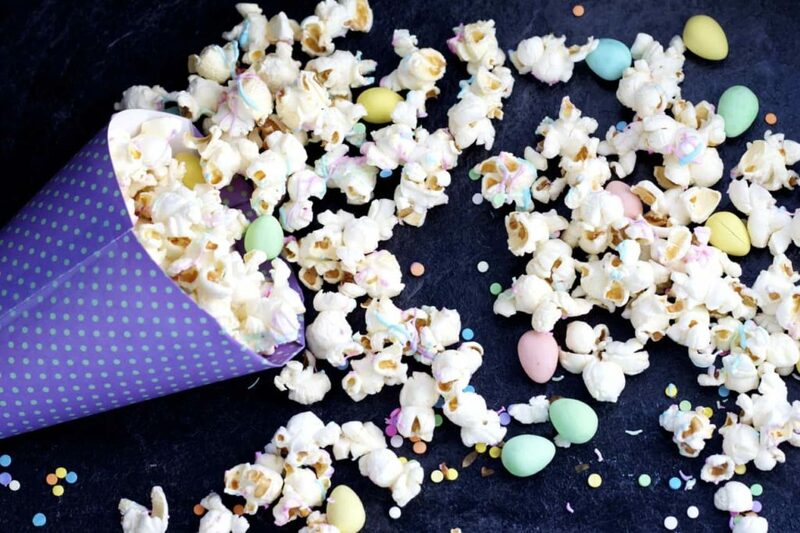 Or maybe it was just the fact that they got Easter popcorn filled with sprinkles and mini eggs for a snack instead of the usual fruit or yogurt! That could be it. At any rate, popcorn IS a great snack, I am completely with them on that. And adding chocolate to popcorn to get that sweet and salty combo is just plain awesome. Sweet and salty snacks are the best. I can never get enough of that combo. I used coloured candy melts for the coloured drizzle on top, because they’re easy and I had some. I love those things, they’re so easy to work with, you can’t really wreck them, and you can melt them right in a ziplock bag, cut off the corner and drizzle them on. And they harden really fast too, so you can be eating your Easter popcorn almost immediately. No waiting for it to set! That being said, you could easily use white chocolate, tinted different colours to drizzle on top instead. That might actually taste a little better (I’m not a huge fan of the flavour of those candy melts, but I think I’m in the minority there) but it would take a little longer, and you need to be a little more careful when melting chocolate then candy melts as it can seize. But either would be fine, so use what you have. I also browned the butter to toss the popcorn with, and that’s totally NOT optional. Okay fine, it is. You could just melt the butter in the microwave. But trust me, it’s worth the extra five minutes to brown the butter on the stove instead. Of course, if you DO brown the butter, you can blame me when you are no longer capable of making regular buttered popcorn. After having it with browned butter, you won’t want to go back to plain old melted butter. It’s too amazing when it’s browned. I’m sorry. Pop the popcorn kernels, however you like, I used an air popper. In a small saucepan, over medium heat, melt the butter. Continue cooking it, whisking constantly, until you see brown bits on the bottom, then remove from the heat. Toss the popcorn with the browned butter and sprinkle with the salt. Spread it out on a wax paper lined baking sheet. Melt the candy melts. I like to melt them in sealed ziplock bags (one colour in each) in the microwave at 50% power. Check them every 20-30 seconds, squeezing them to see if they’re fully melted. Once they are fully melted, cut a small hole in the corner of the bag and drizzle them over top of the popcorn. 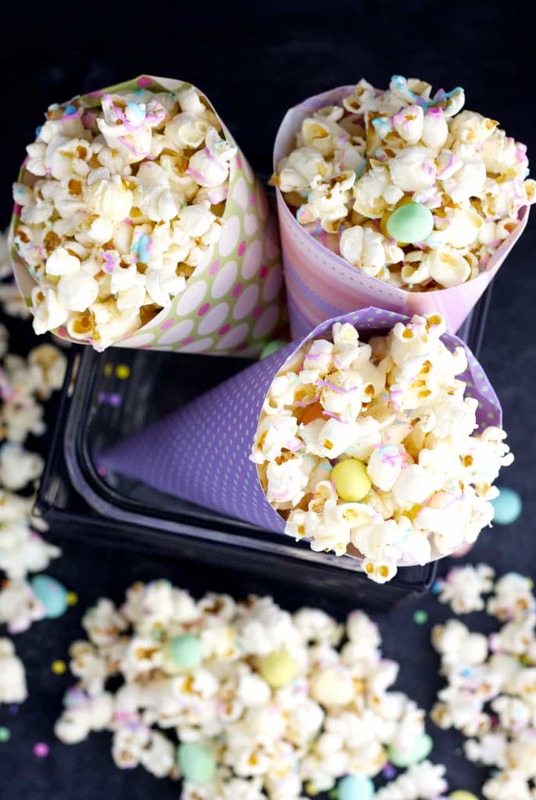 Sprinkle the popcorn with the sprinkles and the mini eggs. Enjoy! It's super pretty!! And the Easter bunny brought so many cadbury eggs that I am totally going to use them in popcorn! Such a fun treat! Popcorn is a whole grain, so I think it's perfectly acceptable to drizzle it with chocolate. Gorgeous photos! Thanks so much Ashley! Being a whole grain definitely makes it a healthy snack right?! At least that's what I tell myself! Looks delicious and such a neat idea. I really love the pictures too. Happy Easter Stacey! Thanks Jim! Happy Easter to you too! Love this popcorn! Totally making it the next time I have movie night with my daughter! Well it's popcorn and chocolate, of course the adults loved it too! Thanks Erin! Yeah, adding colours to snacks is just plain fun right?! Thanks Medha! This is such a cute idea! It looks super easy too and a fun activity for kids! This is greatness. Stacey. Not a recipe, like heck! I love all the colors and the springiness of it all. Thanks Mir! Adding colour always makes things more fun I think! Oh my! What is not to love?! From the sweet festive colors to the sweet salty flavors! You nailed it... Lucky kids! Forget the ham and quiche and asparagus. I'll take a big old bowl of this popcorn on Easter afternoon please! Haha, have it with everything else, not instead, it's Easter after all! Thanks Justine! The most fun Easter treat i can think of. Especially watching Easter cartoons, this would be the perfect snack. Actually even a party for adult would be a great place to serve this. Just incredible! Hahaha, popcorn is easy to do that with - so addicting! Thanks Sarah! Looks beautiful, bright and colorful! 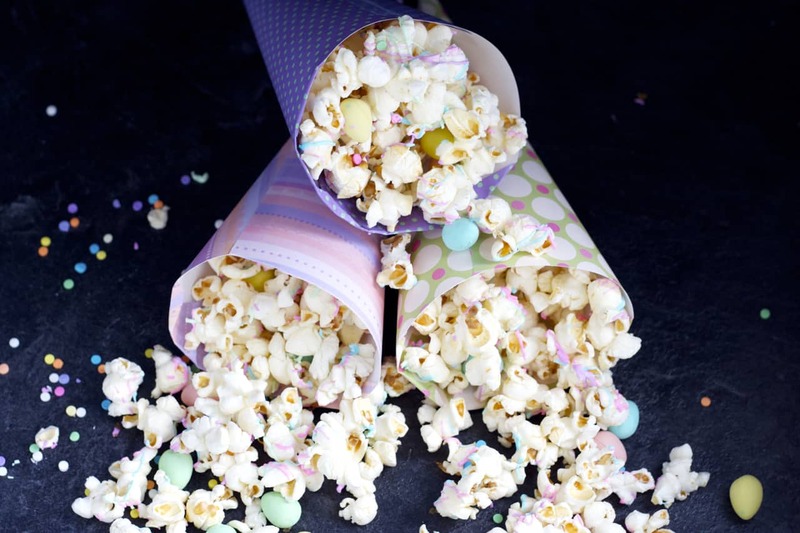 Send some popcorn my way please :) Great inspiration, love the pictures! Popcorn is our favorite! I love how festive and pretty this is! Perfect for Easter and spring! Popcorn is definitely a favourite around here too! Thanks Kelly! This looks so yummy Stacey!! ;-) I love how cute and festive it looks. The kids would go crazy for this also!! A win!! They did! Super huge fans - they informed me it was bloggable. Of course, they say that about absolutely everything, but whatever, I'll take it! :) Thanks Cyndi! this is super cute Stacey! Kids will obviously love it! 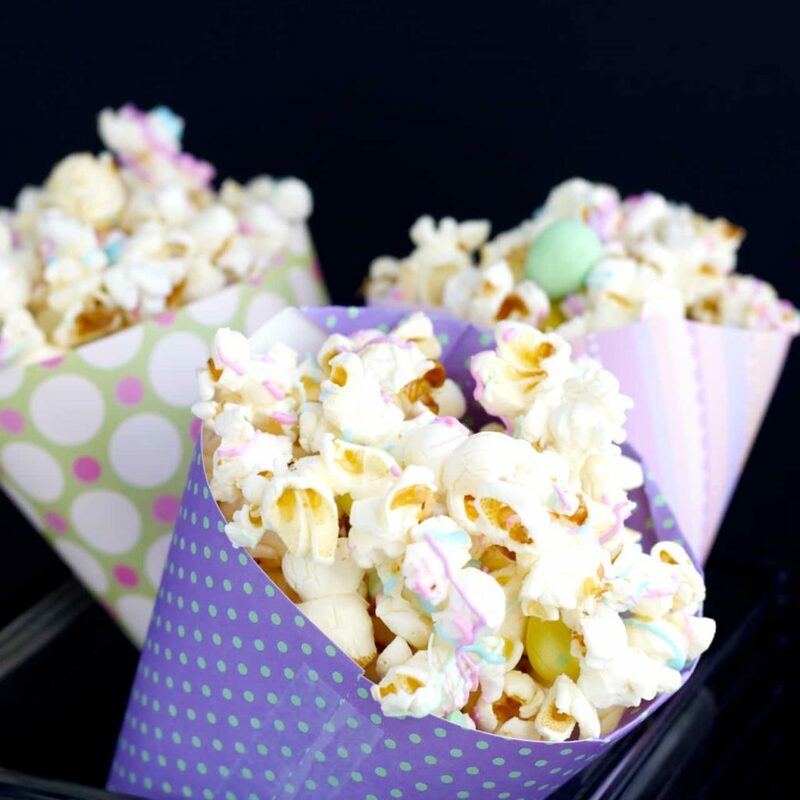 What's not to love about colorful popcorn! Gimme! Thanks so much Kate! Happy Easter to you too! This popcorn looks adorable, Stacey! I love how festive this is! I would totally go nuts over this treat, too...especially with the pretty colors and candy!